In the entrance of my home as soon as you come in the door, there are three pictures facing you. One is of my grandmother, circa 1968 (my birth year as it happens) in a jaunting cart in Ireland. The next is of a mural in Belfast, depicting Mother Ireland, long red hair flowing down her back, looking out over her green fields. The last is the one above, though it’s been blown up and had the light post removed. 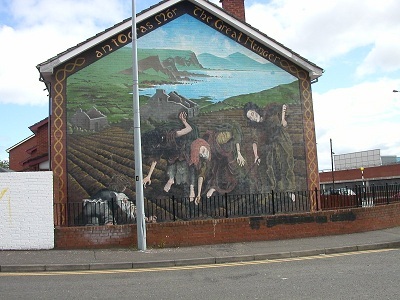 The mural above is in Belfast as well and depicts women picking potatoes in the fields during the Famine. Yes, the potato famine. I keep the photos there because all three, in some respect, represent my history- where I came from, before I even was, what my family and people endured and in the end, I believe, triumphed over. The photos remind me too, that I am blessed with what, to my ancestors, would seem a soft life indeed. Potatoes were the stuff of life, literally, for the Irish of that time. Their diet in the main was potatoes, milk, butter and more potatoes. I can only imagine the horror when the crop failed- not once but three times, turning black and liquid in the fields. The Famine was a watershed moment in Irish history, it changed everything and is the main reason the Irish are scattered so broadly over the face of the earth. To try to encompass the tragedy of it is beyond the mere power of words. It is the dividing line in Irish history, all that came before is pre-Famine history. What came after was unprecedented. Long ago, I read about Carl Jung’s theory of the collective unconscious and his belief that we carry the memories of our ancestors within ourselves, of our entire species actually. I believe that to be true, that in some aspect we carry those memories and experiences with us, always. It accounts for many strange instances of deja vu, or of knowing something that you have no prior experience with. For me it would explain why I feel like Ireland is the home I left long ago, and wasn’t able to return to, except for visits that never last long enough. My own family didn’t leave Ireland until well after the Famine- some sixty years after. I don’t know how they survived it, though it’s likely many of them didn’t. On one side at least, they were farmers. Reading about the Famine was a watershed moment for me too, in my studies of Irish history. It made sense of so many things, it made sense of the Troubles in some respects. Perhaps what is most tragic about the Famine is that it was entirely preventable- there was enough food in Ireland to feed her people several times over, but it was shipped out to England on a regular basis, guarded by army troops to keep away the starving. And while the scope of the Famine is beyond words, a writer must always try. I wrote the following on a weekend, when I was holed up in my attic working on something else. This woman stepped whole from the shadows of my unconscious and took me over for two days. I stumbled down the stairs at the end of it and said to my husband, ‘I wrote something, though I’m not sure what it is.’ I felt that way because I didn’t actually feel I had done more than take dictation from this woman, I had the feeling she was reading the words over my shoulder as I wrote. I had the feeling they were her words, and not mine in any fashion. I still feel that way, these many years later. I do wonder, sometimes, if she was an ancestor of mine and I am carrying her memories within me, taking them forward, and sharing them in what way I can. It was the whole breadth of my experience. Fifteen square miles of soil and wee cottages. The townland, the baile of my youth became the expanse of all my years. You will think I was an ignorant peasant who knew not how to want more. You will smile at my simplicity, spare me a moment’s sorrow and forget. But I tell you- the measure of my dreams was the span of a world entire. I’d like to tell you my story, but first you must understand my landscape. Will you come? Will you look through history’s kaleidoscope, knowing that the passage of time distorts vision and makes the dead seem small, even toylike. As though we existed in dioramas, the sort found in folk museums. I will not bother with the name of my village, for it no longer exists on any map or even as a ripple caught in the traces of living memory. Its roots are there in overgrown stone foundations and depressions in deep grass that were once cart tracks and paths made for feet to fly along. There were twenty-one homes contained on three hundred acres, but that is merely a note for the historians. You couldn’t see the baile until you were almost upon it, it merged with the countryside in an organic manner, a small huddle that contained a wealth of tangled relations, loves, hates- in short all the salt of life. Even our memories were scarcely personal, they were communal, shared, transformed through the tellings and re-tellings. But I think, in the beginning at least, I was different. I wanted all my thoughts for myself, I clutched at memory like straws of salvation. The fire that was to ruin me was burning in me even then. From the day I was born I could hear the grass grow in the fields. It was I, afterall, who first heard the potatoes in their death cries. When people spoke I saw the colors their words left behind. Some said I was a changeling, child of the fairyfolk, but they said it with fondness and indulgence. Later they would mutter from the corners of sunken mouths that my mother ought to have left me on a hillside to die. I cannot disagree that, in the end, it might have been better for all concerned had my mother done just that. Can you define the moment that changed your life, that put your feet on the path to heaven or to hell? I can, though the moment was small and consisted only of five words. It was the hedgemaster who showed me The Word, who stirred the embers in my chest into a consuming blaze. It was myself who sacrificed all to that fire. How was I, who thought hearts were sexless, to know that words were not for women? For words sang to me, ran their relentless tunes and dirges through me like knives. I was cursed with the desire to set them down, to carve them with the perfume of ink into the flesh of paper. But paper was a feast, and ink unheard of. So I set my words in soil and rock, cut them into tree bones, wrote them with blood let free from my wrists and ankles onto rock walls and wooden tables. Later I would open those same wrists in an effort to stave off death. I think those cuts were cursed though, that the fire that burned in my blood, poisoned others. The Word was contained within a small blue-bound book, frayed about the edges. It was the architect of my disaster. The hedgemaster was a fine strap of a man, with a voice that could draw blood from the wind. Would it have mattered had the Word first been spoken by an ugly man with grated tin for a voice? What words, you ask, could cause the downfall of a life barely begun? Five of them, written by a tuberculous Englishman. Ironic that it should be an English poet that led an Irish girl down the road to perdition. ‘…And her eyes were wild…’ Five words and I felt a desire that left me without breath. I was possessed, obsessed, filled with an unholy need for those pages. The man who’d written those words knew me, I felt it surely. I slept with the hegdemaster for that book. Are you shocked? Don’t be, for who can measure the madness of such a desire? Who can say how these passions become twisted when invested in the body of a woman? He’d spoken Keats to me, and unlocked the door of my cage, that was all the seduction I required. He took me down amongst long grass and dusty bluebells up by the old oak where the townland couples courted. Behind closed eyes I saw the rainbow of the words I would soon possess. My terrible greed cost me dear though. For when the hedgemaster moved on, he left more behind than the Word. My son was born under a sickle moon, to a mother bewitched by the Word and a father who did not share his blood. I married the boy next door so as not to bring greater disgrace upon my family than was necessary. He was a good man, with a broad back and a kind heart. I never lied to him, I told him about the Word and how it burned within me like a holy flame. How to hold it back was to let poison free to gnaw my insides. I thought, fool that a young girl can be, he understood. Even when I realized he did not, I thought I could have my words in the dark of night, in the bones of trees, bits of soil and spilled blood. But God, it seemed, had other plans for me and mine. hills. It was a vapor, thick and creeping, pouring itself into crevices and hollows. Into the cup of leaf and vein of soil. It seemed as though Death had breathed out over the land. In the morning there was a fine white dust on the potato stalks, their hardy necks bending already under the lethal touch. We didn’t understand at first. No one ever understands when they are face to face with disaster. It had come so quietly afterall. On hands and knees we scrabbled in the dirt- only to find despair. We didn’t know that was to be the season God abandoned Ireland. He didn’t show his face again for many a year. He left us with four mouths to feed, and no food with which to do it. I hated Him, and yet understood the impulse to run away from such need. I cannot explain the weight of hunger to one that has never known more than a moment’s growl in the belly. Hunger consumes, it eats you alive. It crushes you when it is not merely a question of where to find your next meal, but a matter of knowing there will never be a next meal. When the British came to burn it down there were holes in the thatch of our cottage, for my husband no longer had the strength to patch them. The soot-soaked rain streamed in brown ribbons upon us all, but we no longer had the means to care for such small discomforts. I know it sounds wretched to you, but I could see the stars through those holes. Do you understand- I could still see the stars. The landlord offered us one passage on a ship. Redemption for one, damnation for the rest. We sent the hedgemaster’s son. What price redemption? The landlord only wanted the Word, some pages with ink you may say, a small price to pay for the lives of your family. He might as well have asked for my soul. Did I give it to him? Of course I did, but after I saw my son safe on the road that would take him away forever and always, I stole it back. It was my soul afterall and who can count the cost of such a thing? For my sins my husband took the blame- my husband died, tied to a flogging pole in the village square. Back stripped down to the bones. He ended hating me. Do not blame him. How was he to know he’d married a woman who contained within her the madness of congealed quartos and stifled sonnets? Our first daughter was carted off to the foundling home. I never did find her, though I tried, please understand that I tried. I walked two weeks amongst the lice and dirt and small throated cries to an absent God, that infested that small corner of hell. The flux took my youngest boy while I was gone. The baby was the last to die. I count upon the clicking of my unfleshed fingers how long since she departed and find I cannot separate the days, they swarm together now in a mass of unending misery. I remember how she looked though, like an odd fever dream, a translucent angel. Her bones laying against folds of blue skin like long shafts of pearl. Small mouth rimmed in green from the grass I’d fed her. From my son there is no word. I pretend not to know his fate. I write long fanciful letters in my head from him. I imagine him drinking milk and honey, walking on streets paved with gold, in a new world. And so here tonight under a sharp-faced moon, I remain. I do not know why I cannot die. The cuts from which I nursed my children on blood do not heal well anymore. I pray to a God I no longer believe in that I’ll take infection and die. I pray for the fever to come for me. I have not been so lucky as others for I am still alive. Perhaps I am cursed to walk this earth forever, cursed to live when the very grass in the fields withers black with sorrow. Do not look for me in the history books, you will not find me, there I will merely be one of an impossible number. Don’t search amongst the rollcall of poets- unlike Keats all my words were writ in water. I will tell you where to find me. Follow me up the hill, the one that stretched its toes down to the edge of the townland. Up through the long grass to the twisted oak, where couples once courted and young girls lost their innocence amongst long grass and dusty bluebells. Dig beside the stone that looks like a folded child. A foot down it’s waiting for you to find- shrouded in the homespun I took from my husband’s back, before they tied him to the post. Has it survived the years well? Is it moldy? Have the dead poet’s words bled across the pages, can you smell the copper tang of the blood of those who died for it? Handle it carefully as you turn the pages, give it some small respect before you move on. For it is all the measure of my dreams. Fifteen square miles, the span of a world entire.